Whether you want to experience the buzzing atmosphere of a Rome derby, see your favourite team play at home or simply want to taste Italian football first hand while on holiday, this website will give you all the inspiration and information you need. At Football in Italy you can keep up with the latest goings on in Serie A, find club information and shop for all the best Italian football merchandise. You will also find useful travel advice to help you plan a trip to Italy to watch a game, along with tips on where to stay and what else to do and see while you are there. Fans of both Italian and English football have a big dilemma as Italy and England face each other for their opening Group D match of the 2014 World Cup in Brazil. It's a cliché to state that football is Italy's passion, but it is still true. The majority of Italians support and identify with their local team to some degree; apart from the fans of Juventus, of course, who are to be found all over the Italian peninsula. Despite repeated match-fixing scandals, and despite the constant rumours of sinister plots which sweep around each stadium, football is a very important unifying factor in a country which has been a state for only 150 years. 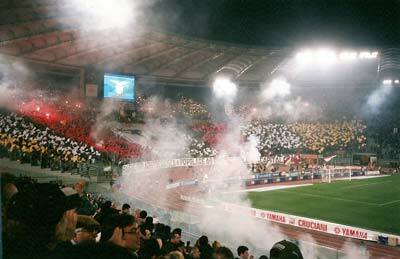 Travelling to Italy for a football match is a good excuse for an entertaining trip. Even if you're not visiting the country especially for the purpose, it is usually quite easy to fit a game into your holiday itinerary. Most towns, including Italy's famous art cities, have football teams playing in Serie A or Serie B. There are football stadia conveniently close to several popular destinations, including Lake Como and Venice. If you can persuade your travelling companions to accompany you, or if you can just sneak off for a couple of hours in the afternoon, you've got a good chance of seeing some entertaining football. It's not just the game itself that will be the attraction. Italy's football fans provide an entertainment in their own right, usually colourful, singing, flag-waving or embroiled in the latest conspiracy theories or disputes. There's always a lot going on both on the terraces and on the pitch, and attending a game is a great way of seeing one face of the real Italy. 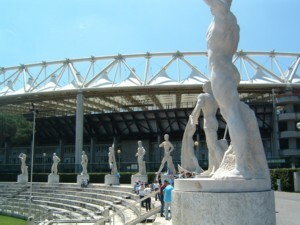 The aim of this website is to provide some background information and guidance for planning a trip to the football in Italy, with team, stadium and location information as well as the background holiday advice that might help you to convince a loved one that a certain football destination would make a great weekend break.